Adam Wilson posted two messages on Twitter on April 15. The first one, "GO BADGERS," might have been sent by any University of Wisconsin-Madison student cheering for the school team. Watch CNN’s “American Morning” on Friday to see Dr. Sanjay Gupta talk about brain twittering. Weekdays from 6-9am ET on CNN. “We can do that,” said Williams, an assistant professor and the principal investigator at the lab in Madison, Wisconsin. “We can do that tomorrow.” In the end, it wasn’t quite “tomorrow,” Williams said, but Wilson had written the software to link existing technology with Twitter “within a couple of days” of starting on the project in March. He sent Williams his first “tweet” — or message — from the brain-computer interface on March 31. “I had set up my phone to get Twitter updates, and I walked in my door and got this message, and I knew it was really possible,” he told CNN by phone. “My wife was sitting there, and I showed her the message and she immediately got excited about it — and it’s rare that I come home from work and she gets excited about what I have been doing.” That’s because using the brain to post Twitter messages is potentially much more than an academic exercise or a party trick — it could help paralyzed people communicate. “These are people who have ALS, like Stephen Hawking, or they have a brainstem stroke, or a high spinal-cord injury,” Williams explained. “There is nothing wrong with these people’s brains. It’s a normal person, locked into a lifeless, useless body.” (The British physicist Hawking has ALS, amyotrophic lateral sclerosis, which is also known as Lou Gehrig’s disease.) Hundreds of thousands of people suffer from locked-in syndrome, Williams estimated. Many of them want just the kind of ability the brain-Twitter project seems to offer, said Kevin Otto, an assistant professor of biomedical engineering at Purdue University in Indiana. “The interesting thing about this project is they are directly addressing some of the patient desires,” he said. “A lot of people think [locked-in patients] want to walk and want fancy prosthetics, but a lot of times what they want are bladder control and basic communication skills.” Otto, who was not involved in the University of Wisconsin project, called it “a very important incremental step to take two existing technologies and marry them together like this.” Williams had been working on brain-computer interface technology “for many years,” he told CNN, before the idea to use Twitter. “The technology we were developing was 10 or more years down the line, so we started wondering, ‘Is there something we can do now’ ” His lab at the University of Wisconsin — like those at Brown University, Purdue and the Wadsworth Center in Albany, New York, among others — is developing ways for locked-in people to communicate. Projects range from manipulating a cursor on a computer screen to operating a robotic arm, and they can include devices physically implanted into a brain. But the Twitter project has a lot of advantages, Williams said. 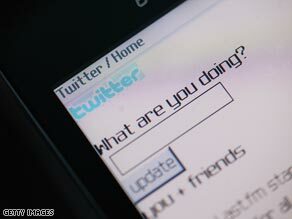 “Twitter fits so many of our needs and patients’ capabilities,” he said. “Their first interest is in being able to communicate in a normal fashion, and at a distance.” Twitter is simpler than e-mail, he said. “If I am locked in and I want to e-mail someone, the format is all wrong. You have to be able to select recipients and group them, copy, paste, send. … We don’t think about that much as normal people, but it can become unmanageable. “Twitter takes care of all those things. They just have to get [the message] to a location where people can come and find it,” he said. Locked-in people communicating by tweet might have followers who don’t even realize they are disabled, Williams said. “Nobody’s going to notice that the person at the other end is disabled. They might not have any idea. And that might be very empowering for people,” he said.